Jason Pominville can appreciate how much everything around the Winter Classic has changed over the years. He was with the Sabres when they played in the first one 10 years ago in suburban Buffalo. Jason Pominville can appreciate how much everything around the Winter Classic has changed over the years. He was with the Sabres when they played in the first one 10 years ago in suburban Buffalo, in a 2-1 shootout loss to the Pittsburgh Penguins. Now, after four seasons in Minnesota, he's back for the Sabres' return to the NHL's New Year's Day game. 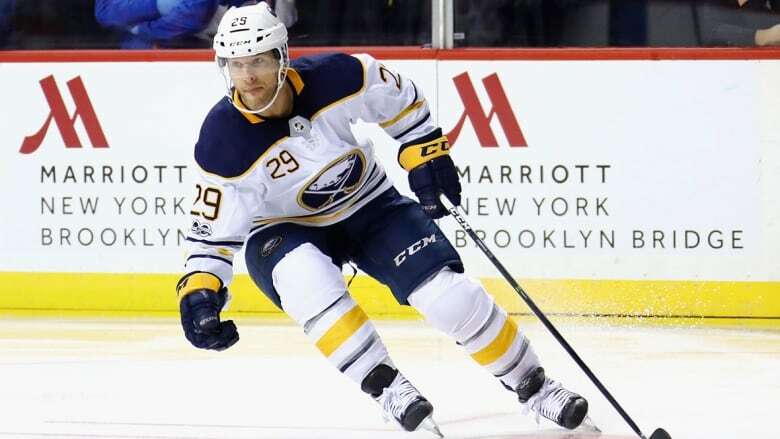 "Look at this, the buildup has been phenomenal," Pominville said Sunday as he addressed reporters after the Sabres practiced at Citi Field, home of baseball's New York Mets and the site of Monday's game against the New York Rangers in the 10th Winter Classic. "The first one was a lot of unknown, no one really knew what the turnout was going to be. Obviously the way it went, the way the fans responded, the way it looked on TV, the way the game ended, I don't think you could've asked for a better scenario for the league." The 35-year-old right wing also played in an outdoor game for the Wild in their win over Chicago in Minneapolis in February 2016. "And now the whole buildup around it from press conferences in the summertime, TV shows, everything around it has really been pretty amazing for us to be a part of it again," he said. It was -9 C when the Sabres hit the ice for practice at 10 am and the same when the Rangers went out 3 1/2 hours later. The forecast for Monday is sunny and about the same temperature for the start of the game. "The ice was awesome," Rangers captain Ryan McDonagh said. "Obviously the cold temps are going to make a hard, fast ice. The only thing that's going to be a little tricky is the wind. We'll see how it goes tomorrow. It felt like you were definitely outside, playing some hockey outdoors the way you grew up on." After their respective practices, each team had time for a family skate on the ice spread across the infield of the baseball diamond. New York coach Alain Vigneault said the distraction was a welcome change from the routine of the regular season, and the players agreed. "It's a great break," Rangers goalie Henrik Lundqvist said. "You play 82 games and everything is a certain way, the preparation the elements of the game, and then you do this. Guys are smiling, it's a different type of atmosphere in the room and the conditions. It feels almost like a new game." Lundqvist, McDonagh and defenceman Marc Staal will each be playing in their fourth NHL outdoor game after having led the Rangers to wins in the previous three — at Philadelphia on Jan. 2, 2012, and at Yankee Stadium against the New Jersey Devils and New York Islanders in 2014. Buffalo's Benoit Pouliot will be appearing in his fifth game outside — including the two in January 2014 while playing for the Rangers. Lundqvist acknowledged the previous experiences make it easier to go through this one. "It helps a little bit," the veteran goalie said. "Just to know what to expect. For me, less distractions because you know what's going on today, what's going on tomorrow. And tomorrow when the game starts you just got to be focused on the right things." For players, the atmosphere and experience trumps any potential issues with weather conditions. "Most kids probably dream of playing this game and I was no different," Buffalo's 21-year-old star Jack Eichel said. "I was watching [Pominville] play in the first one. ... I haven't played in a game outside before so I don't know what to expect. I think beginning of the game will be a pretty simple one and just try and figure out what's working, what's not." The Rangers began the day holding the first wild-card spot in the Eastern Conference — one point ahead of Islanders — and were two points behind third-place Columbus in the Metropolitan Division and six behind first-place Washington. The last-place Sabres were 16 points behind the Islanders with just 10 wins in 38 games. "Fun to just play in the Winter Classic and take your mind off the day-to-day routine of playing and just kind of breaks that, and puts a really special emphasis on one game and you can kind of forget everything else for a few days," said Buffalo's Kyle Okposo, who played for the Islanders in their outdoor game against the Rangers. "You have to enjoy the moment. These are the moments in your career you're going to remember." To mark the 10th anniversary of their appearance in the initial game, the Sabres gave up a home game to be in this one since the Rangers are contractually obligated to play all their home games at Madison Square Garden for a tax exemption.